This is a bit of a special meal for two. The sauce is delicious. The Marsala will keep in the bottle for ages, a bit like sherry, so don’t worry about only using a small amount from the bottle, you can use the rest another time. Put the potatoes and the parsnips in a pan of boiling water and bring to the boil. Turn down to simmer for 10 – 12 minutes or until the veg is tender. Drain and return to the pan. Add the 25g butter, season well and mash. Put a lid on the pan and set to one side. Meanwhile heat the oil in a frying pan. Add the chicken breast, season well with salt and pepper. Fry on each side for 2 minutes on a high heat. Turn down the heat and fry, with a lid on the pan, for 3 – 4 minutes on each side (depending on the thickness of the chicken). Remove the chicken from the pan and add the mushrooms, fry for 1 minute, then add the Marsala. Simmer for 2 – 3 minutes. Mix together the flour and the softened butter. Add to the pan and stir into the sauce, simmer until it thickens slightly. 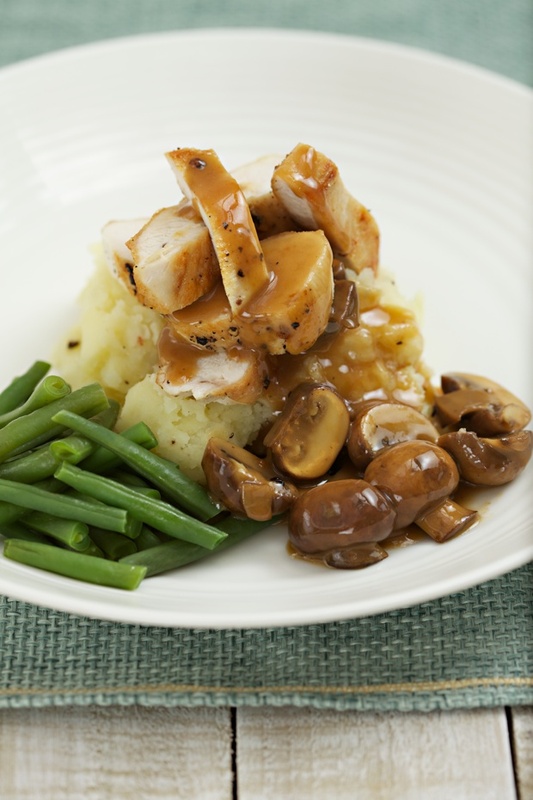 Serve with the mash, chicken breast and the beans.